It was lovely weather today and I had nothing pressing to do, so that made for a perfect opportunity to finally check out some of the land surrounding Leiden. It’s almost a year now since I moved here and I’ve hardly ventured out of the city limits. Not anymore. I did a bike tour through the fields, towns and villages north of Leiden. From start to finish was almost exactly 50 kilometres or 31 miles. This route really is meant for the spring, when all the flower fields in this part of the country are in full bloom. The flowers were all gone now, but it was still a very nice ride through some very typical Dutch landscapes and towns. 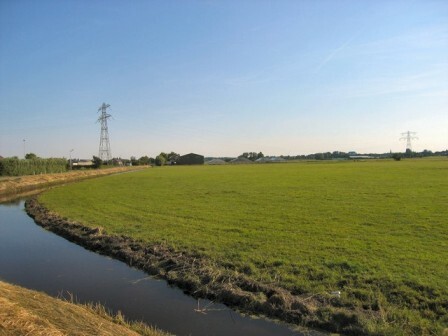 A pasture southwest of the town of Lisse, as flat as everything around here. 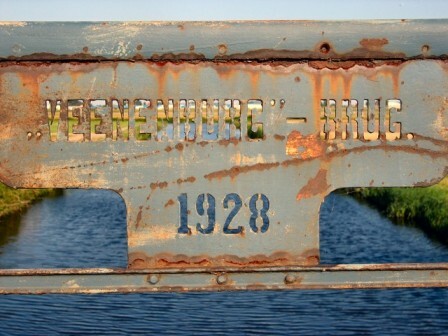 The 78-years-old Veenenburg-Brug (Veenenburg Bridge) northwest of Lisse, passing over one of the wider canals created when peat was dug from these areas many years ago. 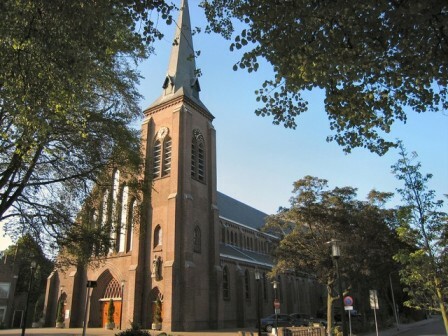 The Roman-Catholic Martinuskerk (Martinus Church) in the town of Hillegom, which is just off the top right corner of the map. I had an excellent dinner in a restaurant next to this church. 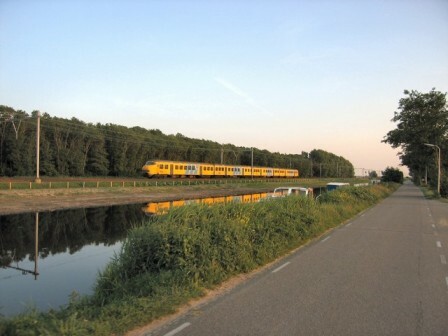 The regional trein from Leiden to Zandvoort passing by the Leidse Trekvaart, a mid-17th-century canal between the cities of Haarlem and Leiden. This railroad was originally built in the 1840s and is one of the oldest of the Netherlands. For some more pictures, check out the Flower Bulb Route album in my photo galleries. It’s been a long time since I last biked this much and I don’t think I’ve ever done fifty kilometres in just over four hours. I biked quite a bit in my 2000, 2001 and 2002 vacations with two high school friends, but we always took a lot more breaks. I had only one big break today (dinner just after the halfway point), plus a couple of shorter ones to take some pictures. I averaged around 20 km/h (12.5 mph) over the entire ride, excluding breaks, with several stretches were I maintained speeds up to 27 km/h (17 mph) for a reasonable amount of time. I touched 43.5 km/h (27.2 mph) on a full sprint (flat road, minor tail wind), but only for a second or two before I had to slow down again. Still, not bad on a normal (i.e., rather heavy) city bike. Actually, I was surprised by how easily things went. I’m in decent shape and I’m used to biking, but only short distances, so I wasn’t sure how this would work out. Well, it worked out just fine. I never really felt tired or in pain, except going up a pair of viaducts close to the end. Most importantly, I really enjoyed doing this. I normally spend way too much time behind my computer and this was a great change of scenery. I got another couple of routes off the website I mentioned earlier and with the summer ahead, I’ll definitely try some of them. I also want to repeat today’s route next year in May. With the flowers in bloom, it should be even better. Looks like a fun ride Ruud! I’m gonna have to take more pictures during our rides. It seems like the camera is always the one thing I forget!